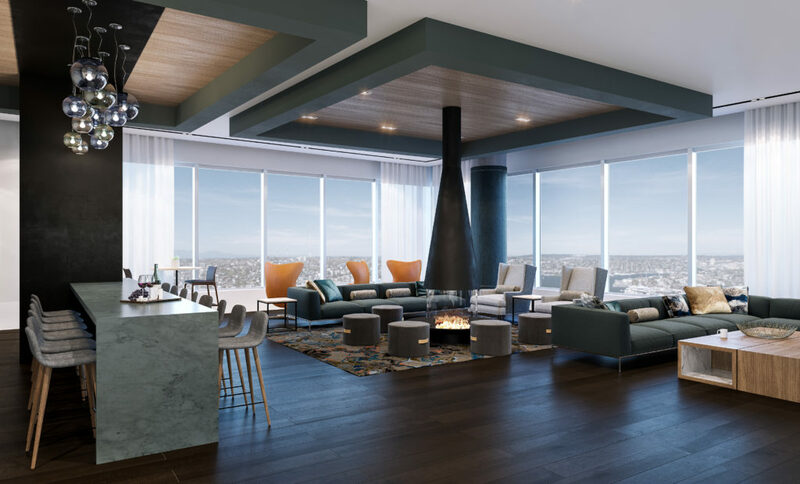 Downtown Seattle’s most anticipated condominium community is celebrating an exciting new chapter in its offering: the exclusive Sky Series Residences at NEXUS. The homes are being built within the towering, 41-story NEXUS condominium high-rise, and will hit the market ahead of their expected completion in 2019. To introduce this prime — and limited — real estate opportunity, NEXUS and Realogics Sotheby’s International Realty (RSIR) are bringing together some of the most innovative brands for the Luxe in the City event, a luxury lifestyle showcase for discerning future homeowners seeking the evolution of urban living. A public sales debut is scheduled for the weekend of June 17th and 18th with an exclusive preview event on June 14thfor invited guests. The centerpiece of Luxe in the City is an artfully curated, full-scale model home furnished in collaboration with InForm Interiors, including selections from Poltrona Frau, Flexform and Knoll to name just a few of the exclusive providers. The striking program caught the eye of LUXE Interiors + Design, a national magazine and the namesake of the event, which celebrates metropolitan living and includes lifestyle leaders Tesla, El Gaucho Hospitality, Glass Vodka, DeLille Cellars, Wipliance, Caliber Home Loans, Seattle Magazine, Butler Valet, Geekwire, and fashion and accessory icons J. Hilburn, Canopy Blue and Alvin Goldfarb Jewelers. Event hosts Burrard Group (developer of NEXUS) and RSIR (listing broker) hatched the idea to celebrate all that’s trending in downtown Seattle. First impressions are at NEXUS will be greeted with a concierge, dynamic artwork and adjacent retail uses including a café and destination restaurant. Cannon says NEXUS is Seattle’s “newest vertical village in the making.” As the only high-rise condo development currently under construction in downtown Seattle, the 382-unit high-rise has already set the pace with presales. It’s uncommon-common areas boast next level amenities such as the 41st-floor Sky Parlor with indoor/outdoor kitchens with adjacent sundecks and barbecue areas; a Fireside Lounge with commanding views; game and media rooms; a catering kitchen and private dining room 400-feet above the city below. Other hotel-like amenities include a full-service concierge and innovative technology platform called XEN – a digital ecosystem that will connect residents to their community, their home and their new, elevated lifestyle. With urban conveniences, world-class design and a second-to-none location in the burgeoning East Village, it comes as no surprise that NEXUS has already sold nearly 80-percent of its inventory 30 months before occupancy. Another motivation is value. NEXUS is currently more affordable when compared to other West Coast gateway cities like Vancouver, San Francisco and Los Angeles, yet experts say it offers a much more compelling investment trajectory given rising incomes and urbanization trends. Seattle is now the fastest-growing metropolitan area in the US, according to recent Census data. Their latest report tracked nearly 21,000 people moving here between July 1, 2015 to July 1, 2016 – that’s about 57 people a day on average and places Seattle in the top spot for both population growth and high-rise construction activity, much of which is residential. However, virtually all that housing being built downtown is apartments for rent leaving NEXUS among the only residential developments offering homes for sale. Purchasing a home at NEXUS during presales requires only 5-percent deposit upon signing with another 5-percent due by June 30, 2018. By planning ahead (and locking in the price) there’s no fear of price escalation given inflation with construction costs or multiple offers, which is commonplace in the resale market. Presale buyers will likely enjoy two years of appreciation on a condo they don’t yet own. This savvy approach may even provide double equity gains if the presale buyer also owns an existing home, which they don’t need to sell for another two years in a rising market. Prospective homebuyers and VIP invitees will learn more about the future of Seattle during the Luxe in the City reception on June 14. The glamorous event promises epicurean eats, handcrafted cocktails, cult wines, a fashion show and a snapshot of city life at NEXUS. Invitations to Luxe in the City event will be limited, so prospective buyers are encouraged to register now for priority sales information. Or simply stop by the open house weekend on June 17 and 18 for a private tour.